Boutell, Charles (2010) . A Manual of Heraldry, Historical and Popular. London: Windsor and Newton. pp. 245–246. ISBN 978-1-153-77482-6. Fryer, M.; Fryer, Mary Beacock; Bousfield, Arthur; Toffoli, Garry. Lives of the Princesses of Wales. Toronto: Dundern Press Limited. 1983. ISBN 978-0-919670-69-3. Hanham, Andrew (2004). "Caroline of Brandenburg-Ansbach and the 'anglicisation' of the House of Hanover". In Campbell Orr, Clarissa. Queenship in Europe 1660–1815: The Role of the Consort. Cambridge University Press. pp. 276–299. ISBN 978-0-521-81422-5. Hichens, Mark (2006). Wives of the Kings of England, From Hanover to Windsor. London: Peter Owen Publishers. ISBN 978-0-7206-1271-4. Van der Kiste, John (1997). George II and Queen Caroline. Stroud, Gloucestershire: Sutton Publishing. ISBN 978-0-7509-1321-8. Warton, Joseph, ed. (1797). The Works of Alexander Pope, Esq 4. London: B. Law et al. Willement, Thomas (1821). Regal Heraldry. London: W. Wilson. ASIN B000OKQJTM. Chisholm, Hugh (编). Caroline. 大英百科全書 5 第十一版. 劍橋大學出版社. 1911年. Gerrard, Christine. Queens-in-waiting: Caroline of Anspach and Augusta of Saxe-Gotha as Princesses of Wales. (编) Campbell Orr, Clarissa. Queenship in Britain, 1660–1837: Royal Patronage, Court Culture and Dynastic Politics. Manchester University Press. 2002: 142–161. ISBN 0-7190-5770-1. Marschner, Joanna. Queen Caroline of Anspach and the European museum princely tradition. (编) Campbell Orr, Clarissa. Queenship in Britain, 1660–1837: Royal Patronage, Court Culture and Dynastic Politics. Manchester University Press. 2002: 130–142. ISBN 0-7190-5770-1. Ward, Adolphus William. 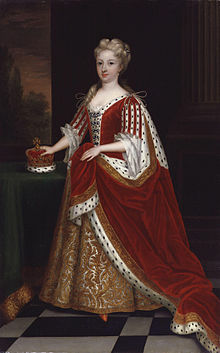 Caroline (1683-1737). (編) Stephen, Leslie. Dictionary of National Biography. London: Smith, Elder & Co. 1887.